Full aroma, medium body, and good acidity. Pleasing fruit tones balanced by a caramel-like sweetness. The overall richness has made Colombian coffees famous. 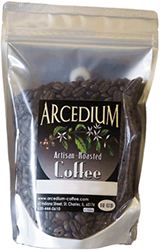 A special recipe of Ethiopian and Indonesian coffees, blended to create a smooth, chocolaty, earthy body with subtle blueberry notes. Bold citrus and smokey tones Guatemala is known for, but also has exception sweetness and a lingering toffee finish. A classic “breakfast coffee” profile. Light bodied and delicately acidic. Hints of maple syrup and berry in the acidity. Pronounced lemon and red berry flavors, a tea-like finish, and delicate hints of jasmine and bergamot. Creamy body, loamy sweet flavors, and oodles of Sumatra’s famous appealing mustiness. Sharp, snappy acidity, bold and heavy body. Floral fragrance, black currant notes, and a wine-like aftertaste. Somewhere between superb and excellent. An appealingly deep and resonant cup, with echoes of molasses and raisin. A heavy, thick bon-bon of a pre-blended espresso. Starts bold and ends like caramel.